Rhinos are the second largest land mammals in the world, surpassed only by the elephant in its bulk and weight. They have relatively short, powerfully muscled legs, a short neck and massive head armed with nasal horns. These ‘prehistoric looking’ animals are a definite must see on any safari. There are 5 rhino species in existence today, with 3 occurring in Asia, and 2 species, the Black and White rhino found exclusively in Africa. When animals have become as scarce as rhinoceroses have today, it is hard to describe them as successful. Yet living African rhinos were, until recently, the widespread, abundant, advanced and successful representatives of a family that had seen a very wide range of types in the past with fossil evidence describing the existence of around 30 genera. The earliest forms of rhinos were small, agile animals, but large horned forms later originated in Asia. The first rhino immigration into Africa is estimated to be around 20 million years ago, with fossil evidence suggesting that the precursors of our two surviving African species entered around 13, 5 million years ago. The White rhino over time appears to have split from a common ancestor with the Black rhino and has shown continuous adaptation to grazing. The main rhino specialty is to feed on coarse plant material, being more selective in their diets than elephants but less so than most antelopes. Rhinos are unable to survive without water and are largely dependent on water for temperature control, digestion and scent communication. Their horns are made up of solid keratin like the toe nails or cow horns. They are not set over a core but on a well-buttressed bone pediment that transfers all the stresses and strains of stabs, swipes and tosses to the skull and forequarters. A rhino has been known to be able to toss an adult horse into the air. There is often some confusion as to what the differences between the two surviving African species are, and it certainly is not the color. The Black Rhino (Diceros bicornis) a.k.a Hook-lipped rhinoceros is the smaller of the two species, with a weight of between 700-1400 kg. It is a low level browser preferring leaves, twigs, and branches typically favoring the edges of thickets and savannas with areas of short woody regrowth and numerous shrubs and herbs. It is a very large animal with Armour like thick skin forming inflexible plates over the shoulders, haunches, sides, legs and forehead. Naturally it has a grayish complexion, but it is rare to view its true color because of their fondness for dust and mud bathing that usually covers its skin. A key identifying difference between it and the White Rhino is its short forehead and very muscular, mobile mouth ending in a very sharply pointed upper lip. Other identifying features are its more rounded ears and concave back and spine compared to that of the White rhino. Naturally the Black rhino is also considered to be more aggressive and territorial but it depends largely on the density of the occurring population, as tolerance is often displayed towards familiar individuals and strangers are often met with aggression. Young are born after a gestation of 15-16 months and the calf soon starts browsing before it is one month old. Females generally drive their previous offspring off before a new birth and the interval between births ranges from 2-5 years. Although they are long-lived animals with a life spanning more than 40 years, this is still one of the slowest recruitment rates of any large mammals. Human pride, superstition and greed have unfortunately led to a great decline in these animals numbers over the past century. Astronomical prices for horns on the black market has seen these animals numbers drop from an estimated 600 000 in 1900 to a mere 4800-5000 remaining today in around 38 officially protected areas in Africa. The White rhino a.k.a Square-lipped rhino is the larger of the two species with a weight ranging from 1800-2700 kg. It is the more common of the two species to be encountered on a regular game drive or safari. It is similar in color to the Black Rhino and has a much longer forehead usually angled so it hangs down low to the ground with a very wide, flat-fronted mouth set low over its chin. Its flexible neck forms a prominent hump when the head is raised due to tall dorsal and lumbar vertebrae. It has a preference for short grass areas with seasonal movements to avoid waterlogged tall grasslands, often moving into areas after dry season fires for the fresh regrowth. In areas with high densities the rhinos themselves maintain grazing lawns. Females and their offspring occupy large overlapping home ranges where social interactions are common. Males defend territories with varying sizes depending on densities. These territories are usually marked with dung middens, urine spraying and foot scrapings along pathways and boundaries. White rhinos are extremely vocal with a wide repertoire of utterances of snarls, gasps, squeals and paintings, usually done by dominant males in displays or juveniles. Females give birth to one calf after a 16 month gestation which is usually driven away at the ages of 2-3 years old. Formerly abundant over most of Africa's well-watered grasslands including much of the present day Sahara. Numbers unfortunately reach its nadir at the turn of the 20th Century with viewer than 100 animals found in Zululand in the current Hluhluwe iMfolozi Park. Through the efforts started by one man B. Vaughan-Kirby, these animals where brought back from the brink of extinction with an estimated population today of around 20 000-22 000 animals. The northern sub species once widespread is now reduced to four remaining captive individuals. Both the White and Black rhinos today face similar threats of rampant poaching driven by an insatiable demand for rhino horn from Far East countries such as Vietnam and China. The future for rhinos seems to now rely on conditions ranging close to that of large scale domestication under armed guard in small reserves and protected areas. There are even calls for the formal domestication to avoid an approaching extinction of these animals in the near future. We need to change the cultural and environmental attitudes of the consumers of rhino products if these bizarre looking animals are to be endowed with a future, not just a past. 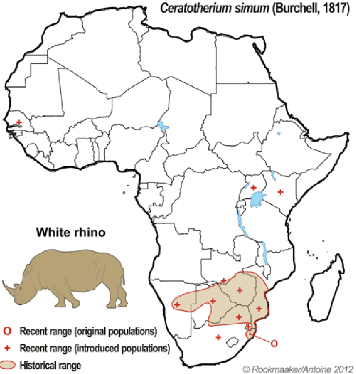 Distribution: At one stage the Black Rhino occupied a very large section of sub-Saharan Africa in all areas but the most arid and the wettest areas. 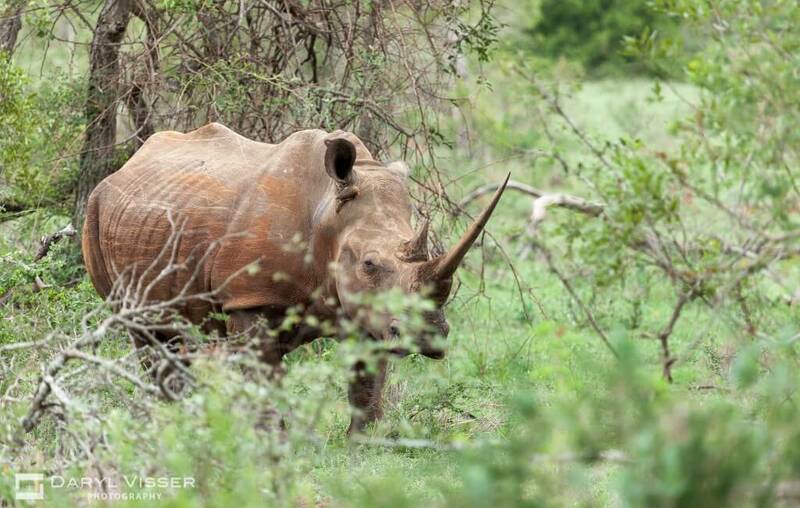 Rhino are now heavily scattered and well guarded as they have come under severe poaching. The black rhino is critically endangered and on the brink of extinction.